Situated in an upmarket residential area.The villa comprises of four bedrooms,2 twin and 2 master double bedroom.One of the twin rooms has access from the master double bedroom which is ideal for families with young children.There are 2 full bathrooms and a W.C.There is air conditioning in the lounge, double bedroom and one of the twin bedrooms.In addition, all bedrooms and the lounge area have ceiling fans.It has a lovely private swimingpool and garden.You can relax in our sunbeds next to the swiming pool, sit at one of the tables located on the terraces or just enjoy a drink overlooking the sea and mountains.It has a outdoor barbecue. 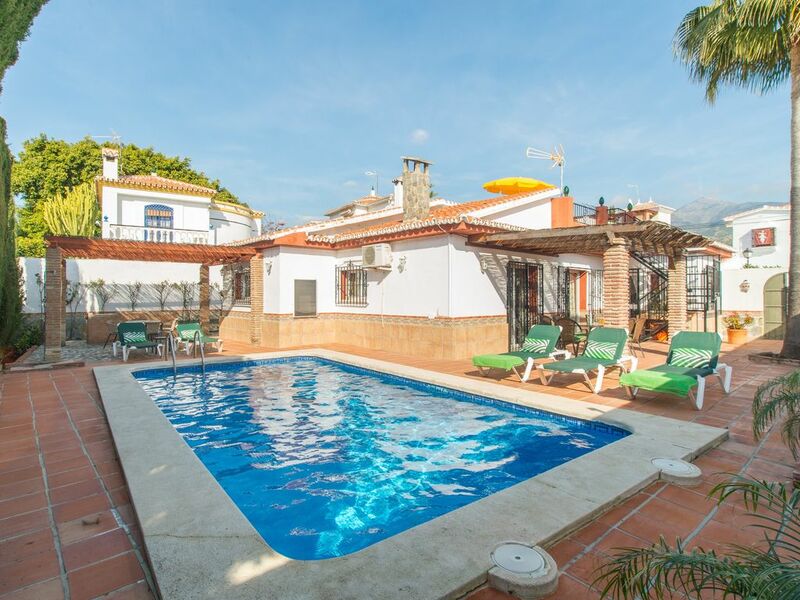 Overall, the villa is an ideal base for a relaxing holiday in Nerja and is ideal for a family or group of friends who are looking for private and comfortable villas for rent in Nerja, yet still close to the town center and beaches. Tv available in english and Spanish, tables,chairs and sofas to relax. The house is in a quiet residential area but a few meters from all tourist attractions.No need to use car to get around. No baby cot available but can be rented for 21 € each per week. Paid in cash at check in. We were 4 couples who stayed together in this villa and it was truly perfect for our holiday in Nerja. The villa is excellent - very beautiful and clean and there is all you need at your stay. The villa is also near to the city centre and the beach so you can well walk to these places. I can warmly recommend this villa for you - stay in this amazing villa and you are surely coming back!